We all want those beautiful luxurious lashes like the celebrities have. For most of us the best lash extension and full mascaras don't come close to giving us the chic Hollywood lashes. So let me ask you this have you ever considered false lashes? I know sometimes the prices are a bit out of budget for that one time look. MAC sells lashes for $14. While in college my BFF use to spend $50 on falsies! That better be an amazing date that you are on to be spending that much on lashes. LADIES listen up! I have found gorgeous falsies on the cheap! 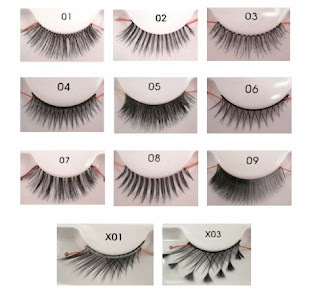 Kiss(yes the nail brand) now offers Ever EZ Premium Eyelashes with Application Strings for.... are you ready for it... $3.99!!!! I know I almost fainted as well. Let's talk lashes! 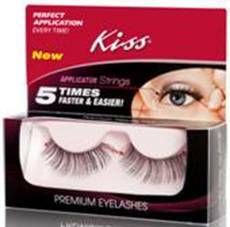 Like I mentioned above Kiss now offers Ever EZ premium eyelashes with application strings which allows for a faster and more precise glue on experience. You'll be getting the same quality as lashes such as MAC and Makeup Forever for just a fraction of the cost! Really you can't beat that! 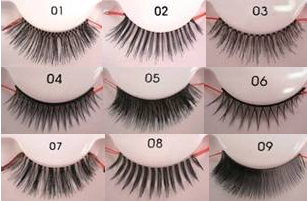 Above are all the lashes that Kiss Ever EZ offers. I think X03 would be amazing for a fun night on the town! Which lash is your favorite? So let's talk about how to apply these gorgeous lashes. 1. You want to apply the glue to the lash base and let set for about 30 seconds. Blowing on the lashes will help. 2. Hold both side of the lash with the string applicators as close to the lash as possible, and place on the eye-lid along the natural lash line. You will want to allow this to set so before you pull the string off you'll want to repeat this step with your other eye. 3. 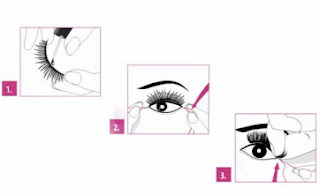 Once your lashes are dry and secured in place you will want to hold and squeeze the lashes firmly between your thumb and index finger push in lashes and gently grab one of the strings and pull. Repeat with the other side of your eyes and then with your second eyelash. You will now have the perfect VA VA Voom lashes! • Most eyelash glues are extremely gloppy and you have to use a Q-Tip to apply them. Not to mention they have a really nasty ordor. Not fun! HOWEVER Kiss 24 hour Strip Eyelash Adhesive is AMAZING it is latex and odor free plus waterproof.... let's face it the water works do happen sometimes. • Keep some liquid liner handy. This will allow you to fill in any areas where you can see tiny slivers of skin between your real and fake lashes. So ladies do you think you'll be batting your lashes with some falsies anytime soon? Stay tuned for Friday's post if you want to see how the lashes look on me! Gosh....I hate to apply mascara....count me out on theses, LOL!! Have a great day sweets! Awesome! Can't wait to see them on you! It seems Im always buying these lashes, lol..just never taking the time to put them on....!! I do theater and have learned so many falsie tips. #1- ALWAYS use black adhesive. #2- Use a bobbi pin to apply adhesive. #3- Hit the glue with a hair dryer for a few seconds before applying to lid. #4- Once the lash is in place, put hair dryer on low, push the cold button and point it at your lid to speed up the bonding process. I'm from metro Detroit area, you? Love the look of fake lashes! I love the look of false eyelashes but always have trouble when I apply them myself. The only time I will get them is what I get my makeup done. It is kind of a fun treat! They have some gorgeous choices! If I could get someone else to put them on me! My daughter is a dancer, danced competitively all through hs and now is on her college dance team...she wears them all the time. I am intrigued by the string application...sounds like it would make the whole process a little easier. I will have to look for these for her and let her know about the incredible price! Thanks for the tip! I've always been intimidated by fake lashes but also have always wanted to try them. Now I'll have to use your tips to try them out! ooo can't wait to see them on! I just painted my nails a grape color that reminds me of something i'd see on your blog. Thanks for all the information. I have never worn them but I sure want to try them after reading all your tips. that eye shadow is gorgeous!!! These girls looks beautiful with their eyes! That belt thing seems pretty awesome! love your blog!! i can't wait to try these. i've been using the revlon self stick, excited to try something new.